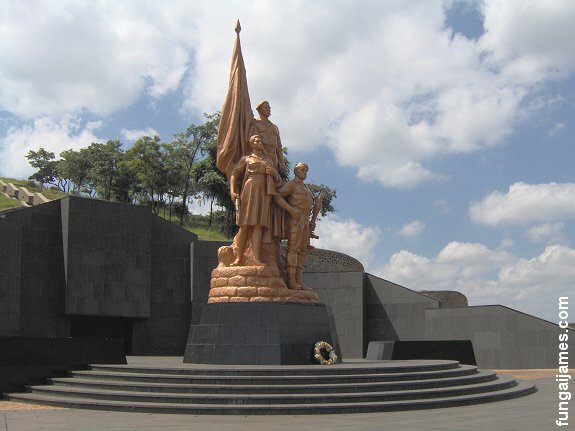 National Heroes Acre is a burial ground in Harare, Zimbabwe for all Zimbabweans who have been declared a hero by the Government. The Government started work on the Heroes Acre in 1981, one year after Independence. The design and artwork used at the site was done by seven artists from the Democratic Peoples Republic of Korea and ten Zimbabwean Artists. See the Site on Wikimapia here. Learn more about the site here. This entry was posted on Tuesday, February 3rd, 2009 at 1:00 am and is filed under Architecture, Construction, Google Earth, Zimbabwe. You can follow any responses to this entry through the RSS 2.0 feed. Both comments and pings are currently closed. There’s supposed to be an NK restaurant in UB in Mongolia I think, also in UB there is a school (primary school I think) named after Kim Jong Suk, not sure if NK had anything to do with running it or building it though. How i wish oneday i can go to this place it such a memorable stories are in there in stones written. I love HEROES!